Ask fellow campers about "Belvidere East / Exit 170 KOA" and nearby attractions. All the RV sites are pull through with cable TV. Most are FHU with the rest being W&E. There are also tent sites and cabins. All sites have cable TV and Wi-Fi. There is a pool, a playground, bathrooms, a laundry, and a pizza cafe during the summer. We camped at Belvidere East / Exit 170 KOA in a Motorhome. This campground is under new ownership as of Spring 2018. It has easy access to the I-90 freeway, and would probably get more business if it lowered its prices to be more in line with the area. This is a "Journey" KOA, so there are no activities or entertainment other than the pool. The new owners have a lot of work ahead of them to spruce up the park, but all utilities are located logically and in good working order. That's what mattered most to us. There is a limited number of channels on the camp cable, and it worked well. There's plenty of southern sky if you bring your own TV cable satellite dish. 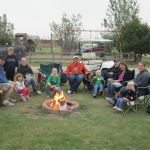 We used this KOA as a base to visit The 1880 Town (amazing), 1940's Zephyr Dining Train (that served great breakfasts), the Minuteman Missle Silo Historic Site Visitor Center, Wall Drug (a must do) and the Badlands National Park. We camped at Belvidere East / Exit 170 KOA in a Fifth Wheel. 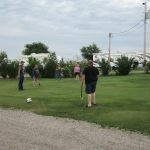 Using this as a home base, be sure to visit The 1880 Town (amazing), the 1940's Zephyr Dining Train (that served great breakfasts), the Minuteman Missle Silo Historic Site Visitor Center, Wall Drug (a must do) and the Badlands National Park. Good place for an overnight or two. Nothing nearby. Quiet park. We camped at Belvidere East / Exit 170 KOA in a Motorhome. 1880s town at interstate exit. This is a good campground. Very friendly and helpful staff. They take you to your campsite where you sit on a concrete pad. All utilities are in the right place for convenient hookups. Satellite access in our site #40 was excellent and WIFI was top notch. They make pizza in their office/store and deliver it to your site! About 3/4 mile off interstate 90 so no noise at night. A good place. We camped at Belvidere East / Exit 170 KOA in a Travel Trailer. There is an old western town at the exit off the interstate and a half mile from the KOA campground. We had a pull through with plenty of room so we didn't have to unhook. Friendly, efficient staff. A nice park. Nothing close but we were just passing through. Ordered their pizza which they deliver. It was fine. Better than finding something to cook. Plenty of grass to walk the dog and a dog park. Cable worked well and WiFi was ok. We camped at Belvidere East / Exit 170 KOA in a Motorhome. Long pull through sites. FHU, everything worked well. Service by all employees encountered was excellent. Dirt drive into park, don't expect to leave with clean vehicles. Pizza was good and delivered to our door. No shade, nice view of lake. Nice grass for tables, chairs etc. 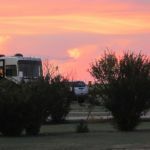 We camped at Belvidere East / Exit 170 KOA in a Motorhome. Great views of prairie. Off the freeway about half mile so no freeway noise! Used the laundry. Newer washers and old dryers but all worked great. Laundry room could use a good floor dusting. Under new ownership. Lots of rain in recent weeks so in need of weeding in some areas. Ordered their pizza and it was excellent and delivered to door by a pleasant young man. We camped at Belvidere East / Exit 170 KOA in a Motorhome. Really out in the country. An old frontier town is at exit from the freeway and is of interest. The sites were far enuf apart and some were concrete pads. Hookups were handy. Small trees, but trees cannot be expected in the Great Plains. The staff were very nice. Quickly changed out site when the other site was very muddy and difficult to drive through. Our site was a drive through. The owners seem to be doing extra to keep the place neat and driveable. We camped at Belvidere East / Exit 170 KOA in a Fifth Wheel. Friendly staff. Nice KOA. Not packed together like many KOAs. Old park with brand new owners. They do have a nightly pizza menu that they will deliver to your site. The owners are very friendly and accommodating. We camped at Belvidere East / Exit 170 KOA in a Motorhome. I think the only thing this park has going is it is somewhat close to the Badlands and a 1/2 mile off the interstate. About a mile off I-90, so it is quiet! Large sites. Pool. Shower room wasn't new, but clean and more than adequate. Friendly, helpful office staff. (Rate listed is approximate.) We camped at Belvidere East / Exit 170 KOA in a Motorhome. The entrance road is rough getting to the campground but it is ok once you pass through the gate. BTW the gate closes at 10pm so must be here by then or no go. Friendly and efficient staff that made check-in easy check-in. The sites are pretty level, gravel sites. Some of the best spacing we've seen in a campground. We learned that they combined some of the sites from two into one so that explains that. The sites are also staggered so you aren't looking directly at your neighbor.. There are a few trees but more decorative than for shade. There is grass between the sites which was pretty brown this time of year. Our site only had water and electric. Directv satellite worked fine. Verizon 4g 4 bars; The park is only about ½ m from I90 behind a small hill so there is little to no noise. The WII FI worked, and it worked well - a first in a KOA - and one of the better in any RV park we've been to in 6 years. We would definitely stay here again. We camped at Belvidere East / Exit 170 KOA in a Motorhome. Nice campground with a great location near the 1880 Town. They were getting ready to close for the season when we visited, regardless, the staff was very friendly and helpful. We camped at Belvidere East / Exit 170 KOA in a Motorhome. 1880's town is good for a quick tourist stop. This is a great KOA run by a very nice family. We've stayed here several times enroute to Wyoming. The roads are wide as are the sites so easy to navigate with a Big Rig. All facilities worked well, we will definitely return. We camped at Belvidere East / Exit 170 KOA in a Motorhome. Nice clean KOA, a credit to the brand. Big dog park and areas to walk the dog, which we appreciate. Very clean and well maintained. WIFI worked well. About a half hour from the amazing Badlands loop so we went through the loop twice during our 4 day stay. There are no supermarkets nearby so be sure to have supplies. I guess they must have some basics at the large gas station at the Hwy 90 exit. My one complaint with KOAs is the 11:00 check-out. The standard for RV parks and hotels is 12:00 and its not like they need to make up beds for the 2:00 check-ins so . . . Why? It just seems unfriendly. We camped at Belvidere East / Exit 170 KOA in a Motorhome. The area is wide open with few shade trees. Sites are good sized with level gravel sites and fire pits. Staff was superb, the 'ladies' were very gracious. The pizza was good. No restaurants near. Not much to do. Best as a over night stay. If staying an additional day as we did, the only attraction for miles is an 1800 town (fee), but interesting. Would definitely stay again. We camped at Belvidere East / Exit 170 KOA in a Motorhome. Only thing to do in the area is the 1800 town. Park is just past 1800 Village, convenient to I-90. It's rare that you get to birdwatch this close to the freeway. Bring your binoculars. There is "1800 Ghost Town" within a few miles of the campground that we enjoyed visiting. I'd recommend gassing up at a different location than the gas station at the Ghost Town. Gas was considerably more expensive there. They also have a café with menu! 1880 Village and Gas station at the same Exit. Don't be fooled by the address. This is NOT in Midland, which is 15 miles off the Interstate. It's very close to the interstate but still feels rural. There is a solar heated pool, game room and library. Small restaurant on site. Reasonable prices. 1880 town about a mile away. Are you affiliated with Belvidere East / Exit 170 KOA ?